There are many misguided humans who believe that black cats are bad luck. This is a silly superstition. Tell the humans who share their homes with Midnight or Gentle Ben than these felines are bad luck. They will tell you that this is wrong. Sadly, this makes it more difficult for cat rescue groups to place black cats. But for two humans, the black cats they rescued were nothing but good fortune. These humans, who had just moved to New York, went to the ASPCA’s cat rescue facility to pick out felines to share their home with. 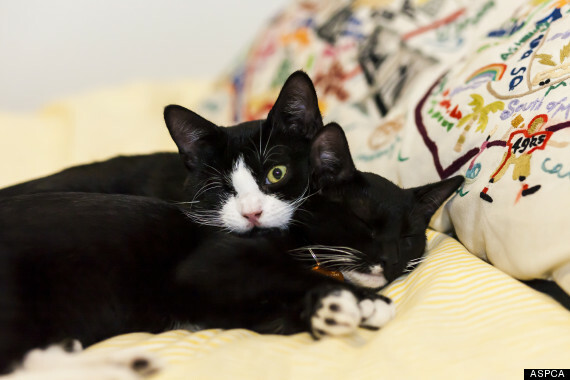 There were two tuxedo cats who had come into the shelter at four week of age. These two were good furiends, and they both had come in with upper respiratory infections. Adult felines like me can fight off upper respiratory infections, but for kittens, it can cause problems. These two, named Hunan and Adore, suffered vision problems as a result. That was it. The humans decided that they needed to give these two felines a home. But caring for these two was not without challenges. Because of the upper respiratory infection, Hunan lost an eye and Adore has cloudiness in hers. And within two weeks of taking these kittens home from the cat rescue, Hunan had to be rushed to the hospital. That experience made the humans these two cats share their home with realize both the responsibility of caring for a special needs cat and the rewards from doing so. “Caring for a cat with special needs, medical or otherwise, can be an incredibly enriching experience. If you have the means and stamina, I would recommend caring for a cat who needs the special attention the most,” said one of the humans. I, as a special needs cat and the human definitely agree.